KEAAU, HAWAII — In terms of quantifying school failure, at least by Department of Education standards, Nawahiokalaniopuu Iki is nearly unbeatable. The school, whose student body is among the poorest in the state, earned just 20 points out of a possible 400 on Strive HI, the state’s new system for measuring student achievement and improvement. Statewide, the school — Nawahi for short — ranked 287th out of 288 public schools. So are the students dejected? Hardly. The “failing” score is a political weapon — and a source of Hawaiian pride at Nawahi. 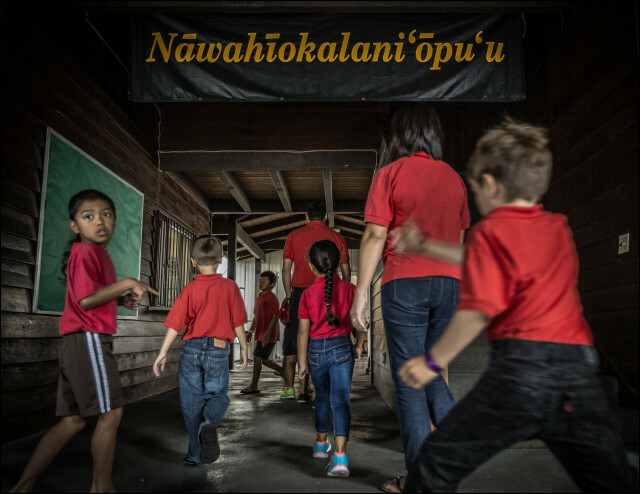 Students walk into Nawahiokalani’opu’u Hawaiian Immersion School in Keaau, Hawaii.